Do you like School Bus License? Share it with your friends. The school bus driver has a ver demanding job. You will see this in the game "School Bus License". 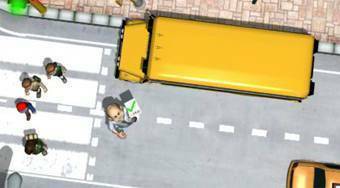 Your task will be to make a difficult test, which any bus driver has to take. Firs levels of the game are very simple, but in time the degree of difficulty will increase. Respect traffic rules and do not make any mistakes. An accident would mean that the game is over.